Walter was a genius who, at this very late stage in his career, inspired admiration and love from what was largely a pick-up orchestra of some of the most talented musicians in California in mid-twentieth century. Recording quality and production was excellent. 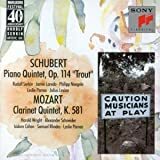 There are many recordings of the First and the Variations, and most are good if undistinguished, with the musicians laying down a track of music that they have played dozens upon dozens of times. This is not one of those recordings; my understanding is that the musicians on this recording had been hand-picked. They knew that Walter was old...very old...and they wanted to give him their best. They did just that. The woodwind tutti playing is phenomenal, and the brass (particularly the horn section) is similarly outstanding, as are the solo violin lines. I wish there was a listing of the first desk players in the orchestra; I have tried in vain to find such a list. 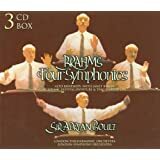 I put this one up there (and maybe above) the legendary Brahms recordings that Szell did with Cleveland at roughly the same time period. 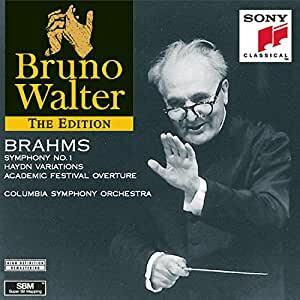 The program notes are gushing when they call Bruno Walter the most eminent interpreter of Brahms in the twentieth century, but here is a conductor, still capable of making this powerful Brahms First in 1959, who was twenty when the composer died. He learned his Brahms fro no less than Hans von Bulow and would have met the composer n person except that Brahms had entered his last year and was too ill to travel (Walter's mentor Gustav Mahler made the journey to Sichl, where the aged Brahms spent his summers, and found the old man melancholy and misanthropic - yet from a modern perspective, Brahms was hardly elderly at 64). There's no need for me to heap my praise on so many others'. 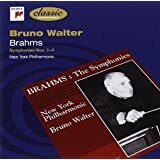 I only want to recount my surprise, after an absence of ten years or so, on returning to Walter's stereo Brahms First and finding it so dynamic and alert. When it first came out, his Columbia Sym. cycle was considered less than the mono one he made in the early Fifties with the NY Phil. Waning energies were attributed to Walter's troubles with heart disease, but that first cycle comes in raw sound, even when remastered, and it has some rough edges, too. There's a driven quality that might be the influence of Toscanini; there was enormous pressure in America for every conductor to ape Toscanini or fall under his shadow. The remake is more Viennese, always moving forward but with a core of relaxed enjoyment in music-making. In the second movement we realize that not being close to Toscanini doesn't mean you've drawn near to Furtwangler. Walter's style isn't philosophical or searching. He's just a master of the traditional Romantic style that nurtured him in the nineteenth century. without being personal, he's authentic. The orchestra can be criticized for imbalances due to an under-powered string body, but in Brahms's day the strings were often even less. the scoring sounds sweeter and mellower for being able to hear horn and oboe almost all the time rather than Karajan's wall-of-sound violins. Walter is also more modest and lyrical than either Furtwangler or Karajan. In short, a reading that can carry you through a lifetime. It has Walter's famous singing quality and strength of purpose, too. After recording the symphony in Nov. 1959, Walter returned the following January for the Haydn Variations and Academic Festival Over. (The latter at least used to be almost universally known to young listeners - but now?) Both are done with the same blend of mellowness and authority. For once, the overture actually feels festive with the extra snap Walter gives it. I have listened to many recordings of Brahms 1st. 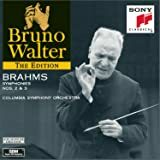 I have also read extensively the reviews others have given on every Brahms 1st available on Amazon. 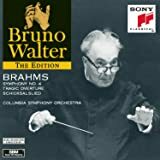 Along with Klemperer's Brahms 1st, Walter's Brahms 1st is the one to own. The sound is incredible. The performance is closely-miked with deep rich bass. (a conductor's perspective). But, I like it that way. This performance draws you in. I can listen to this performance over and over without tiring. 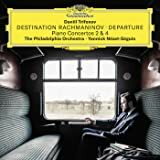 Do not get confused with the multitude of choices out there on which performance of Brahms 1st to get, I have done the searching and listening, get this Brahms 1st and you will not be disappointed. Can't beat that combination. The Variations, I think, are the highlight of the album. Consider the simplicity and familiarity of Haydn's melodies and the complexity of Brahms' "variations". One gets the best of both worlds: simplicity and tunefulness AND complexity! Great listening, topped off with Academic Festival. Enjoy. I especially like how Walter opens Mvt. I - this is the tempo!